June has whizzed by in a flurry of memory-making holidays, sponsored events and volunteer activity. THHN fundraisers and donors have been doing us proud and making us proud too. We are so lucky to have such a great team and such amazing teamwork. Thank you to everyone who supports us. We are THHN; we are the memory makers! Sunday, 26 June was an incredible day for THHN! Seeing a team of our runners completing the Torbay Half Marathon, marshalled by many of our super volunteers, seeing nearly 700 children taking part in the second THHN Schools Challenge and Memory Maker Mile Fun Run was a truly heart-warming experience. We were also immensely proud to be one of the main charities for the Rotary Club of Preston Family Fun Day, held on the same day. 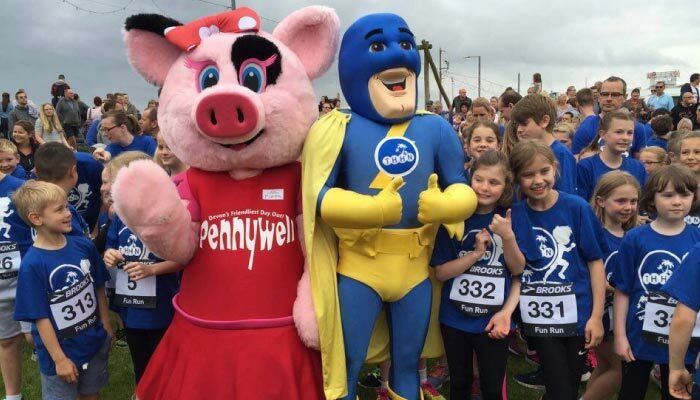 This all came together thanks to teamwork, so special thanks to our brilliant team leaders Brian Lewis, Carolanne Hart and Rebecca Davies, to Greg Fine and his team at the Torbay Half Marathon, our super Schools Challenge sponsors Pennywell Farm and the fantastic Rotary Club of Preston. We would like to say a big thank you to the amazing Contract Cleaning Supplies SW Ltd, who kindly provide free paper products, year round, for our Memory Maker caravan at Finlake Holiday Park, Chudleigh. Their generous support is greatly appreciated. Our Memory Maker caravan is stunning at the moment, with freshly stained decking, fantastic new privacy trellis – donated by Riviera Decking Ltd – and beautiful planted flower troughs by volunteers Helen and John Tillen. Thank you to them and to everyone else involved in making and keeping it looking so amazing. Dudley Rae and his fabulous charitable organisation, the Viking Warriors, have been popping up at events to promote their fund-raising efforts for THHN and other charities. Chief among these will be their Motoscape Car Rally from Torquay to Prague in September. They were out in force at the Torbay Airshow and Screen on the Green at Torre Abbey. A massive thank you to the Warriors. 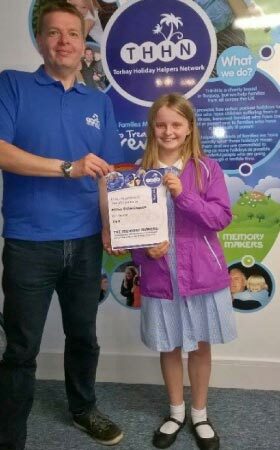 Schoolgirl Millie Etherington has been fund-raising for THHN as part of her Civic Award. She recently presented us with £64 she had raised from a sponsored walk. Well done, Millie, and thank you. THHN turned the Babbacombe Fayre into a sea of blue with its striking stand selling books and other items from our Memory Makers Shop and promoting the work of our great little charity. We are looking for marshals to help out on the day at various points along the City to Sea route from Exeter to Babbacombe Downs on Saturday 3rd Sept, can you spare an hour or two? If you think that could be you, please contact brian@thhn.co.uk. In another busy month for visiting families in need of a memory-making holiday, June saw guests welcomed at Hotel De La Mer, Babbacombe; THHN’s own Memory Maker caravan at Finlake Holiday Park, Chudleigh; the Marine Hotel, Paignton; the Clifton Hotel, Paignton; Buckfast Abbey; and Outlook Holiday Appartments, Paignton. A special shout-out goes this month to Sarah and Mike Hill of Angels Tearooms in Babbacombe, who saved the day for THHN! Our beautiful Memory Maker caravan had a major electrics and fridge malfunction, putting the whole caravan out of action! Sarah and Mike very generously gave up their private lodge so the THHN family who were coming would not miss out on their holiday. As ever, we are hugely grateful to all the businesses, attractions and organisations that help make these getaways so memorable for the families concerned, including: Teddy Mountain UK, Westcountry Fruit Sales, Daisy Cakes, Halletts the Bakers, Claire’s Cakes, Luscombes Butchers of Torbay, D&H Fisheries, Riverford and Project Linus UK. Meanwhile, two amazing new supporters have come on board with accommodation. Shearings Hotels will donate half-board accommodation to THHN families at their hotels across the country, while Dame Hannah Rogers Charity (Hannahs) has made available its facilities at its 90-acre site at Seale-Hayne, near Newton Abbot, which is able to cater for people with a range of disabilities. This has enabled THHN to expand the range of holidays it can offer. We can’t cure illness but if we can relieve suffering in some small way, then what we do is worthwhile.